Time for our imaginations and engineering skills to take flight! In the Invention Convention exhibit at the Children’s Museum of Houston, we have the Launch Cage, a place where we encourage our visitors to build and test rockets and paper airplanes! But, while your basic “dart” airplane flies great in a straight line, is it possible to get it turn or do tricks? You bet! All you need are ailerons. Ailerons are the flaps in an airplane wing. On real airplanes, ailerons can extend, rise up, or go down, changing the shape of the wing. By changing the shape of the wing, the ailerons affect how the air flows over the wing, allowing them to control the direction the plane flies. Let’s try this with a paper airplane to see the effects in action! 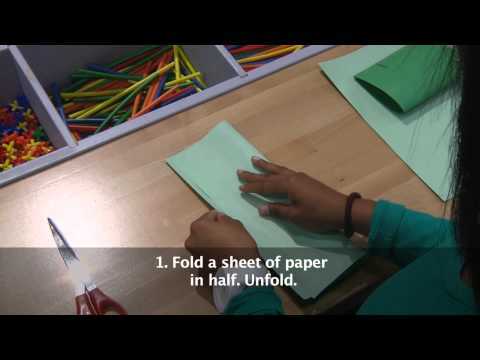 Fold the piece of paper in half length-wise (makes a long rectangle), crease, and unfold to create a mid-line. Fold the top two corners to the mid-line to create two right triangles. Crease. Grab the long side of each triangle and fold to the mid-line. Crease. Fold the airplane back up along the mid-line. Crease. Fold down one side about 1/2″ from the mid-line, parallel to the mid-line. That makes your wing. Repeat step five with the other side to create the other wing. Fold the wings back up. Cut the ailerons on both wings at the same time – one cut about 3/4″ from the mid-line and one about 1/2″ from the edge, both about 1/4″ deep. Holding the wings straight out to each side, place a small piece of tape over both wings near the middle of the plane so it doesn’t open along the mid-line. Ailerons change the shape of the wing. On paper airplanes, when the ailerons are up air pushing against them causes the plane to rise. When the ailerons are down, the air pushes the wings down. Even slight changes to the ailerons can cause dramatic changes to the flight of your plane. Can you get your plane to turn left? To turn right? To do a barrel roll? A loop the loop? Here’s a shout out to our Regions Bank friends, thanks for making our O Wow Moments a reality!